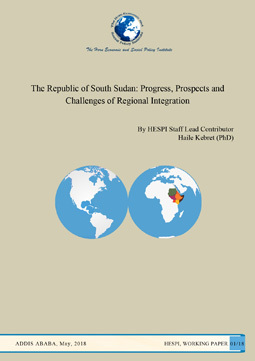 The purpose of this research is to assess the extent to which the Republic of South Sudan will likely benefit (in the short, medium and long-run) from joining any trading arrangements with the existing trading blocks in Africa, but particularly in one of those in Eastern Africa. This assessment is and should be anchored on the following salient features of the South Sudanese economy. The Republic of South Sudan is: A young country with little past experience in managing bilateral and multilateral economic trading arrangements; With very poor infrastructure; Mainly dependent on a single commodity (oil) for its exports; Totally dependent on imports for almost all consumer goods and its essential needs; Despite rich farm land and ample natural resources, none of the sectors are well developed; and unskilled workforce, dysfunctional bureaucracy and unstable macroeconomic environment. In short, with relatively unsettled socio-economic and political environment and a disorganized management system there seems to be, at least at the moment, the need to examine the pros and cons of joining a trading block in pertinent. In particular, what South Sudan is likely in a position to export, at the moment except for oil, is not apparent; and the marginal benefit of getting a market for such a product may not require a direct trading arrangement with any of the trading-blocks. This is mainly due to, despite a potentially rich country with abundant resources, the actual economic activity is at its early stage and the attendant management is probably ill equipped to navigate through and manage the daily detailed procedures of regional integration protocols.